One Night at the Call Centre is a witty, romantic and humorous story of six call center employees by India's bestselling author, Chetan Bhagat. 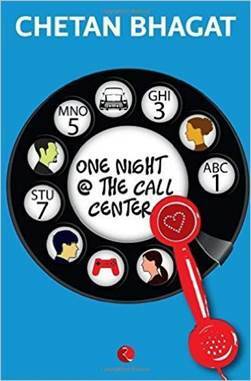 One Night at the Call Center is set in one night in a call center in Gurgaon. The call center employees provide technical assistance to American consumers and help them run their lives smoothly. The six friends – Shyam, Priyanka, Esha, Vroom, Radhika, and Military Uncle somehow try to make it through the shift as tonight was no ordinary night. It is Thanksgiving in America and the phone lines are going crazy! Then one call, from a very special caller changes everything. This phone call is from God! One Night at the Call Center will make for an engaging and riveting read and is a must have for all Chetan Bhagat fans. Chetan Bhagat is an Indian writer and novelist. He has written several best-sellers including Five Point Someone, One Night at the Call Center, 2 States and What Young India Wants. Considered one of India's biggest English novelists, Chetan Bhagat is an alumnus of the Indian Institute of Technology, Delhi and the Indian Institute of Management, Ahmedabad. Four of his books have been adapted into Bollywood movies, three of which went on to become hit movies: 3 Idiots, 2 States and Kai Po Che! CLICK HERE to Buy One Night @ the Call Centre (English, Paperback) by Chetan Bhagat with special discounts and Options with Cash On Delivery and 10 Days Replacement Guarantee.